‘Tis the season to start booking your Christmas parties early, avoiding any stress later in the year and giving your team something to look forward to and motivate them till the Christmas holidays! Nothing brings people together quite like good old Christmas food and some drinks to finish off the working year, making meals one of the most popular London Christmas party ideas. However, if you fancy something a little more informal, a Glamourous Ruby Blue Bar Christmas party will be right up your street. Head down to the bustling capital of England and gaze at the beautifully decorated streets of London at Christmas before enjoying some food with Ruby Blue. 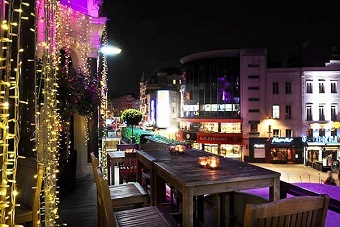 This bar is located in the heart of Leicester Square, and is ideal for either a lunch or dinner celebration to remember with your team. When you arrive, someone will be there to kindly show your group to your reserved seating, which will be a place for everyone to relax for the remainder of the evening. Once everyone is comfy and ordered a round or two in, be prepared for a festive feast like no other. This Christmas buffet is jam packed with Christmassy favourites, new flavours and some more exotic dishes to cater for the whole of your team! Some of the food includes classic Christmas dinner on a stick, red Thai chicken skewers and fig and honey tartlets to name a few. Followed by a dessert treat of mini brownies and fruit skewers with dipping sauces, a buffet is the perfect, informal Christmas party idea. As well as the food, everyone will receive half a bottle of wine each to get the evening started and your whole team in high spirits. After all the food is polished off and everyone has had a chat, the rest of the evening is totally up to you. Whether you want to try a few of Ruby Blue’s champagne cocktails or dance the night away before the Christmas break, London’s Glamourous Christmas with RubyBlue is ideal to end the year on a high! Simply give us a call on 0161 341 0052 for any more information, or to have the whole experience sorted by us.